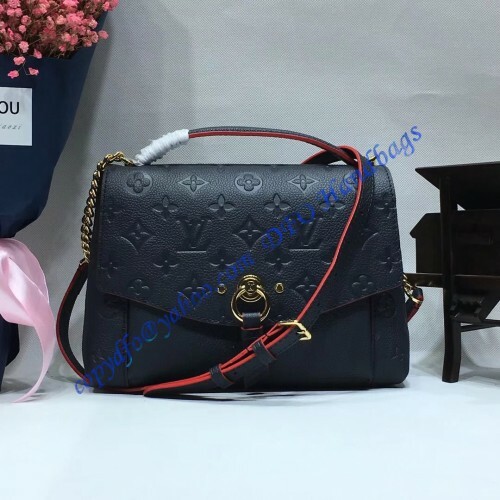 No one understands fashion like Louis Vuitton, and no one offers such unique yet casual bags as they do. Louis Vuitton was 16 years old when he decided to become a trunk-maker. He quickly became famous in Paris for his craftsmanship. However, he waited until he was 33 years old before opening his own workshop. That’s how the brand we all know and love started off — from a single man with a vision in 1854. Although the company only grew since, they remain true to their spirit of originality, creativity, and their tradition of premium quality. This Blanche bb bag made in monogram empreinte is proof of all of that. 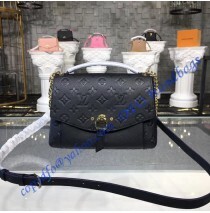 When you look at this bag, at first you will think that it looks a lot like the LV Blanche model. However, this bag has one big difference that you will love. 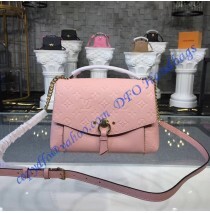 It has a very different top handle that’s short, made of thick monogrammed leather. It has a distinct red outline that gives an interesting silhouette to the entire bag. Another difference is the chain-leather shoulder strap — the combination of two materials makes this bag a good fit for any outfit, day or night. The strap is long enough and adjustable so that you can carry this bag in your hand, on one shoulder, or cross-body. The bag itself is made of a combination of monogrammed and smooth high-quality leather. The Louis Vuitton’s signature secure closure is present here. It looks even better thanks to the beautiful metal loop-and-leather detail. On the inside, there are two small pockets next to the large main space, and there’s one open outer pocket. When it comes to size, this bag falls under the small category. Its width is 8.9”, height is 6.7”, and it is 3” deep.